As New York District Attorney Roger "Butch" Karp prepares a murder case against the veteran, he meets with investigative reporter Ariadne Stupenagel, who suspects that one of her sources for a story on high-level government corruption was a victim in the shooting. This points not to a random act of violence, but a hired killing that goes to the top levels of our nation. In this fast-paced thriller, Karp goes up against corruption so powerful that he, his family, and his friends are in danger if he intends to prosecute those responsible for the murder of an FBI whistle-blower. 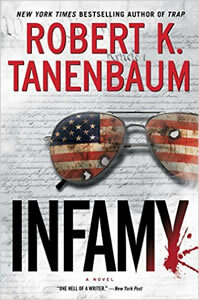 Filled with edge-of-your-seat action, stunning plot twists, and, "solid courtroom scenes" (Kirkus Reviews), Infamy will keep you guessing until the very end. When I was checking if I have read prior books by this author, I saw that I had read Outrage, book 23 in this series. I really enjoyed that book as well. After finishing this book, I can guarantee you that I will not like years past again between books by this author. I really like this character, Butch. As far as attorneys are concerned he is one of the best ones I have liked in books. He gets to the point and knows his stuff. I don't ever want to meet him in court. Although, he was not the only one that I enjoyed seeing in action in this book. The other person was journalist Ariadne Stupenagel. It was easy to see why she got top stories. Everything from the military aspect of this story, to the characters, the court room drama, and the ending was great. If you have never tried this author out now is the perfect time.